Kia is now the best car company in the world. Why do I say this? 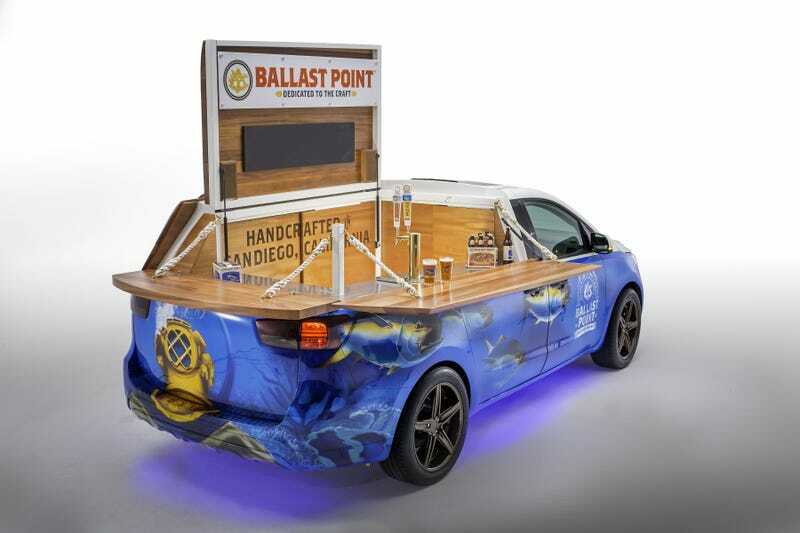 Because their concept cars from the SEMA show are equipped to feed you the two most important food groups, beer and ice cream. Hooray for both of those things! Inside the van are two functioning Micro Matic taps, 120 feet of copper beer-cooling coils and space for up to four half-barrel kegs of beer. Audio speakers have been integrated into the roof to make this the partying-est minivan in history. Then Kia has this Soul EV that's also an ice cream delivery truck. It brings tasty treats from San Francisco-based Smitten Ice Cream, and besides the colorful paint job, this Soul has custom tanks filled with the liquid nitrogen needed to keep the ice cream frozen. A silver table is connected to a trailer in the back for Smitten's Brrristas (I can't believe I just typed that, but whatever) to prepare the ice cream dishes. Now I wish I had gone to SEMA this year. I could have just hung out at the Kia display all day, drinking beer and eating ice cream. DON'T JUDGE ME.